Good morning; I hope that the sun is shining down upon you wherever you are as it is on me. I recently tested the waters for a new blog series, Saturday Suggestion. Though I got a several responses from my readers (the series begins this Saturday), I received one of a nature I hadn't been expecting. I was contacted by a non-profit organization and asked to write about them. To say I was humbled was to do injustice to my emotions. It is a grand feeling to have one's abilities recognized in this nature. However, because of the nature of the request, I felt a weekday posting would give it the proper type of exposure to you, my friends and family, that it deserves. Once the initial excitement settled down I began to consider how to approach this. With the fiasco that was the Kony 2012 movement, I decided that there was only one way in which to proceed: research. I've spent the last several days combing over the website of today's post and have reached the conclusion that this is a very legitimate organization that has joined with an even more important and legitimate cause that I think we as Nova Scotians, Canadians and people of the world can and should participate. Now that the minor details are out of the way, let's get to the good stuff. Clean Nova Scotia is the actual non-profit that is helping to organize and promote this event. They themselves have been around for over 20 years now, originally founded in 1988. For over two decades, Clean Nova Scotia has been working closely with communities, individuals, businesses as well as governments and corporations in an effort to help clean and maintain our environment. When I saw the corporate and government connections, I admit I questioned whether this was some ploy aimed at the government as a public relations stunt; it is not. It is a collection of good, caring men and women, young and old, who have a sincere and passionate desire to clean up and maintain our environment. They are people like you; like you; like you; like me; like any one of us. So what is Clean Across Nova Scotia then? Sounds like it's the same thing; it is not. 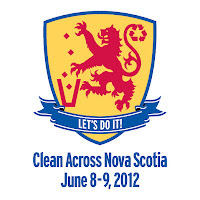 Clean Nova Scotia is the non-profit organization; Clean Across Nova Scotia is the event/movement being organized and promoted by Clean Nova Scotia (CNS). So let's talk about this wonderful event centered around cleaning up our own communities and environment to create a better place for us all to exist. Clean Across Nova Scotia is not the first such iniative that has been brought forth from CNS. Some of you Nova Scotian readers may know of another, annual clean up event called the Great Nova Scotia Pick Me Up. This new event, though not necessarily aimed at replacing the old one, aims to bring the two together as a single event; sort of a replacement; upgrade is a better word here I think. So if they already had a clean up program, why bother with another one? Well this is the really super exciting part of all this. CNS new volunteer community clean up is part of a world wide, global movement to create a better world for us all. That global movement is called (you may have guessed it by now): Let's Do It!World Cleanup 2012 (everything checked out on this site as well). What is even more exciting is that Nova Scotia is not only the first Canadian province to get on board for this but it is also the ONLY Canadian province to commit to the great cleanup. I can tell you're becoming increasingly curious about all of this; as you should be. This is the type of event and movement that anyone and everyone can participate in. It's all inclusive and it's only side effects are community spirit and a cleaner place to live. The actual cleanup is still some time away. It isn't taking place until June 8th and 9th. This means that you still have all kinds of time to find a team within your community, start your own cleanup team or to contact CNS on how to bring this great event to your community. You can do all that registration stuff here. I strongly urge you to encourage your community to take part; in today's world of technology, it is easy to lose out on that ever crucial and important physical human interaction and socialization. Here is a great way to begin to reaffirm and strengthen the community bonds and ties within your own town or city. That is about the gist of the background of this event as well as all the links to further and specific details you will need to first inform yourself and then to begin your participation process to helping the world become just a little bit greener and a little less polluted. I wanted to make sure that I left myself a little bit of space in which to talk about this event from my own perspective; offer my own take and opinion on it and why I have chosen to share this with you. The world is a crazy place. Every day you can pick up a newspaper, turn on the television or listen to the radio and our ears and minds are instantly filled with chaos and madness. It's so easy to disassociate from the problems of the world when we have so many of our own as individuals; I have been guilty of this myself in the past but I have come to realize something very important: we need to re-discover our community roots and bonds. This event is staged behind the premise of making the world a greener and cleaner place. Truly, this is as noble and humble a cause as any and I completely support it and am looking forward to contacting groups in my community to participate. However, my primary reason for that participation is not what you might think. This great cause will most definitely help to cleanup what is out there; it won't clean oil or toxic waste spills (the really bad stuff) but it will get rid of a lot of that unsightly trash everywhere. What really turns me onto this event is the community aspect of it. An event like this has the potential to re-unite friends and neighbors in a community that has begun to drift apart; it has the opportunity to instill a sense of pride and awareness in the upcoming generation of youth; it sets a precedence to those who would destroy our environment that we will not take it; it helps to re-establish our natural connection to our environment and to nature in general; but most importantly of all to me, it brings together and bridges gaps and barriers of all types: age gaps, cultural barriers, economic disparities, etc. This type of volunteer community event calls out to all who live within it; not just a select group. It brings us together as one. To Nova Scotians: Get cleanup teams going in your communities. Check the map and see where they are already starting and where they need to be started. I have issued a challenge (below; spoiler!) to the rest of Canada to step up to the challenge; let us set the bar high for them; let us give them an expectation and goal to work towards. Let us lead by example here in Nova Scotia and encourage the rest of Canada, and the world, to get out there on June 8th and 9th. There are already 25 000 plus volunteers in Nova Scotia; you can be 25 001. To Canadians: Nova Scotia has set a precedent. Check that list of countries again and see for yourself; Nova Scotia is the only Canadian province on the list. Let's change that. I know you, my Canadian readers, are passionate about this great land of ours, the home of abundance, this nation of plenty. I challenge YOUR province to be the next on the list; in fact I think that we can get EVERY province and territory on board. Let us show the world our passionate devotion to our environment and our communities. I know you folks in Ontario love a competition and I know your folks out in British Columbia are especially big on the environment...what are you waiting for? We are all Canadian and we here in Nova Scotia would love some company. Help show the world your dedication and commitment to a clean environment; even if Harper won't. There are 25 000 of us in Nova Scotia. With a national population of nearly 35 million we can easily get over a million Canadians across the country. One million Canadians. To All Other Countries: There is a long list of countries and the states/provinces/counties/towns which will be participating in this world cleanup; I issue you the same challenge as the rest. Get up, get out and get cleaning. Find an organizing team in your own countries and communities or start one up yourself. You can be the start of the rebuilding of your own community and it isn't even that hard. Spending time together and making your community a better, cleaner place to live. What greater reward do you need? There are about 6.95 BILLION more people out there beyond Canada, there is no reason we cannot reach a goal of a BILLION people coming together on those days. Get going! Together we can all make a difference. So the challenge is issued. Will this amazing event fix all of our environmental problems? No. How could it? That's a ridiculous expectation to have. The expectations of this event should be that of the increased and strengthening of community bonds; a drastic and increased reduction in the amount trash and waste in our communities and environment; a sense of pride both in community and individually; a reconnection to the importance of the community and those that live within it; a reestablishment of our link to nature and our environment; the creation and sharing of an idea, an idea of change, change for the better, change for the good, for the good of all; and to remind people of how much they love and need one another. Together, we have the opportunity to start setting the new 'status quo'; the new 'mainstream'. It is our planet; it is our only planet. Without it we have nothing; we are nothing. If we do not take care of it, it will not take care of us. A heartfelt thank you on behalf of Clean Nova Scotia! You've done a fantastic job of capturing and promoting the Clean Across Nova Scotia program. We are very excited to have you on board for this worthwhile, global initiative. Clean Nova Scotia is an impressive initiative, I am awed by what you do. Across the Atlantic, this Saturday is National Coastal Cleanup day in Norway. More than 250 cleanups will take place along our long and convoluted coastline. Last year 2000 volunteers participated, and we are aiming for twice that number now. It is amazing and inspiring what people can do together when inspired. Keep ut the good work!